I find it fascinating how trends are always changing. What is currently “in” was once “out,” and what is currently “out” will eventually be back “in”: for example elbow pads, fanny packs, and high-waisted jeans have recently resurfaced just as oversized square eyeglass frames are once again in style. Go figure. And in the horological community, I say we are witnessing my favorite comeback of all time: the pocket watch. The pocket watch has always been a timepiece of great elegance. Even the legendary George Daniels deemed it to be more so than a wristwatch. He stressed the feel of a pocket watch and the ability to carry it with you and examine its movement whenever you pleased were traits you simply could not find in a timepiece strapped to the wrist. The pocket watch also captures attention wherever it goes, making it a great subject of discussion and intrigue. Daniels explains his view in the video below. One of the best ways to get your hands on a watch possessing the traits George Daniels describes is to buy one made prior to the twenty-first century. Luckily, antique and vintage pocket watches have never been more accessible. The internet is running rampant with dealers and restoration experts possessing magnificent timepieces from as early as the seventeenth century. Some of the most distinguished antique and vintage pocket watch dealers are Antique Watch Company in the United States, owned and operated by watch restoration expert Rusty Tuggle, and Pieces of Time in London founded by Johnny Wachsmann, who often employs the watchmaking services of independent restorer Seth Kennedy. Both Antique Watch Company and Pieces of Time offer pocket watches from various centuries, and they all come fully restored and functional. Having had the pleasure of visiting both Tuggle and Kennedy’s workshops, in addition to viewing Pieces of Time’s beautiful collection in London (followed by a great discussion of pocket watches with Wachsmann’s son Marc over delicious sausages and drinks), I can sincerely say that these horologists are some of the most genuine and passionate individuals in the industry. Their love for watches fuels our own as they allow us the opportunity to once again own and wear incredible timepieces that helped inspire traditional watchmaking as we know it today. While antique and vintage pocket watches may not be for everyone, many of the most respected watch manufacturers today offer more and more options for the vest year after year. These pieces of haute horlogerie are crafted at the highest levels of expertise. 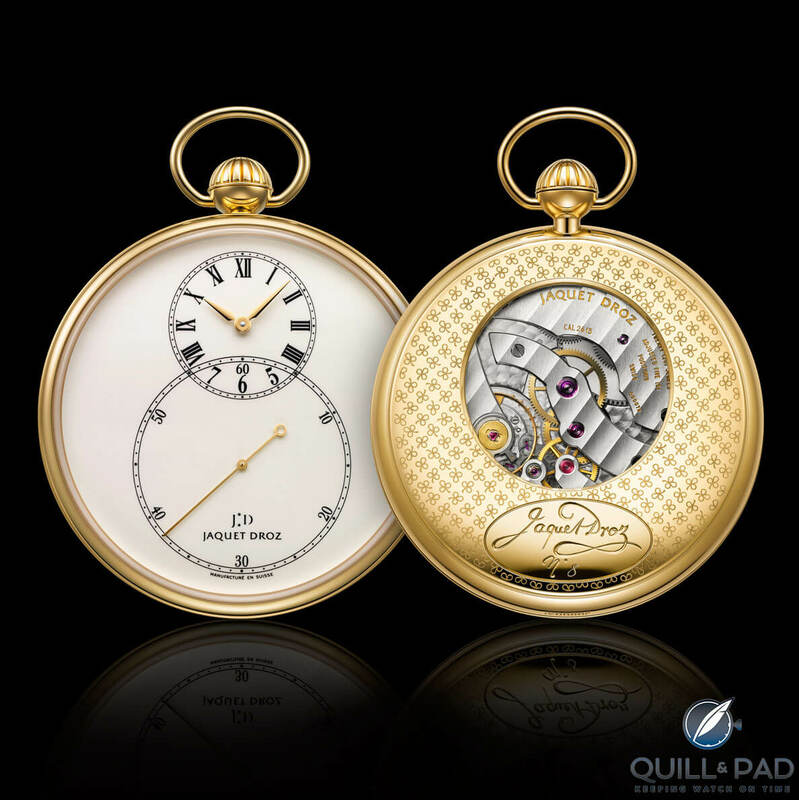 And three wonderful examples of modern pocket watches come from Jaquet Droz, Patek Philippe, and Breguet. Jaquet Droz is renowned for its automata and complex micro mechanics. I recently stopped into the Fifth Avenue pop-up store in New York City and had the fortune of examining the acclaimed Tropical Bird Repeater under a loupe. The craftsmanship was breathtaking. However, while the hummingbird fluttered and the peacock spread its feathers, it was another timepiece that really caught my eye: the Grande Seconde pocket watch. The Grande Seconde may not feature automata, but it is undeniably just as beautiful. With a 50 mm engraved 18-karat yellow gold case, the Grande Seconde is powered by the manually wound Jaquet Droz Caliber 2615 with 20 jewels, a 40-hour power reserve, and beating at a 3 Hz frequency. The most fascinating aspect of this pocket watch is its ivory-colored, high-fire enameled dial presenting the time via two overlapping subdials, the larger displaying the seconds (hence the name “Grande Seconde,” which means “large second” in French) and the smaller the hours and minutes. High fire (grand feu) is one of the most difficult enameling techniques in watchmaking. To create a stronger enamel less prone to cracks, the dial is repeatedly layered and fired between 800 and 900 degrees Celsius (see Why Do Ulysse Nardin’s Dials Look So Good? Because Donzé Cadrans Authentically Fires Enamel for more on the subject). This process slowly brings out the desired hue of the dial and permanently sets the enamel. The result is a unique, shimmering surface that cannot be replicated through simple lacquering. Pocket watches are no strangers to Patek Philippe’s collection, particularly considering Adrien Philippe was the inventor of the stem-wound movement in the 1840s, which did away with the pocket watch’s winding key. While known for its classic wristwatch models like the Calatrava, Patek Philippe has maintained a production of pocket watches and currently offers nine different open-face and hunter-case variants including Reference 973J. The Patek Philippe Reference 973J-001 is a 44 mm, 18-karat yellow gold timepiece with a white lacquered dial, applied Arabic numerals, Breguet hands, and subsidiary seconds at 6 o’clock. The watch features Patek’s 17”’ LEP PS manually wound caliber comprising 137 components. The movement has 18 jewels with a 50-hour power reserve and a balance oscillating at the traditional 2.5 Hz. 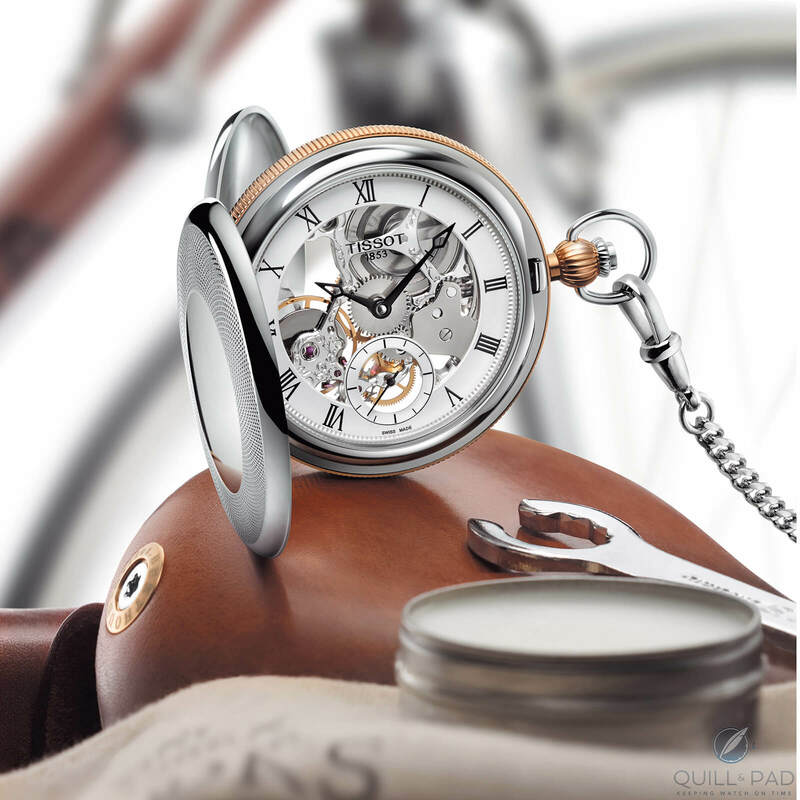 No pocket watch article would be complete without a Breguet timepiece! Abraham-Louis Breguet is renowned for his horological innovations and master craftsmanship. Some of his greatest contributions to watchmaking included the gong spring for striking repeaters, the overcoil in the terminal curve of balance springs for concentricity, moon-tipped hands and, most notably, patenting the tourbillon, a regulator style created to negate the effects of gravity on the oscillator in different positions. Though these were all invented more than two centuries ago, Breguet’s firm continues to push the limits of watchmaking and preserve the rich history of its founder. This ideology can easily be seen in the Classique Grande Complication Reference 1907, which combines some of Breguet’s greatest inventions. Its 508GS caliber features a minute repeater with a grand sonnerie and a one-minute tourbillon with a balance beating at 2.5 Hz. The 508GS offers a 65-hour power reserve and displays the time on a stunning guilloche dial via a regulator-hour subdial and sweep minute hand. Housed in a hand-guilloche 18-karat yellow gold hunter case, the Breguet Classique Grande Complication exudes elegance. For much more see Breguet’s Modern Million Dollar Pocket Watch: The Classique Grande Complication Reference 1907. If you are just getting into pocket watches and crave something modern, there are plenty of options on the market that won’t break the bank. From micro brands to easily recognizable manufacturers, almost all more affordable modern Swiss pocket watches are powered by movements from the ETA 6497/8 family. One such watch is the Tissot Bridgeport Skeleton, which does a great job of creating a vintage aura using modern manufacturing. Featuring a skeletonized dial underneath a mineral crystal with blued hands, subsidiary seconds at 6 o’clock, and an open-face case, this watch checks many of the major boxes for elegance in a pocket watch while providing the technical look so many love. It is powered by the ETA 6498 hand-wound caliber with 17 jewels, a 46-hour power reserve, and a balance oscillating at 2.5 Hz. As it celebrates its 125th anniversary, Omega has announced the revival of the 19-ligne pocket watch caliber first manufactured in 1894. Using a combination of modern and original components, the company will reproduce the movement for use in 19 new pocket watches. Though Omega will only offer a limited number of these timepieces, its efforts also serve to point out the importance of a pocket watch and they will no doubt play a major role in the reintegration of the timepiece by any manufacturer into societal norms. This is made evident as Omega reminds us of the elegance and spirit of the pocket watch in addition to advice on how to wear one. Omega ambassador Eddie Redmayne does a wonderful job capturing this feeling and explaining those options in the following video. With its return, I feel it is important for us to all remember the significance of the pocket watch. It is one of our greatest inventions, combining elements from multiple trades and sciences into one pocket-sized machine. Its elegance is not only in its ability to tell us the time but, as Daniels describes, also in its ability to provide a sense of comfort and pleasure to its owner. Not many people today have experienced this effect of a pocket watch and hopefully that will change. A pocket watch is a beautiful thing and I, for one, am glad its back. I have worn a pocket watch for years. Nice to know I won’t feel so lonely now. You’re definitely not alone and I am happy to hear that! What kind of pocket watch do you carry?